Ginkgo biloba is sometimes called a "fossil tree" since it is the last of its kind, with no close relatives. It works well in the urban landscape because of its high tolerance to a wide variety of conditions. It is widely known in medicine as a possible aid in preventing memory loss. The scientific name assigned to this species is Ginkgo biloba and is the only species left in the genus and the Ginkgoaceae family. The names usually used for this tree include Ginkgo biloba, maidenhair tree, and Japanese silver apricot. The best zones for this tree are Zones 3-8. It is native to China. 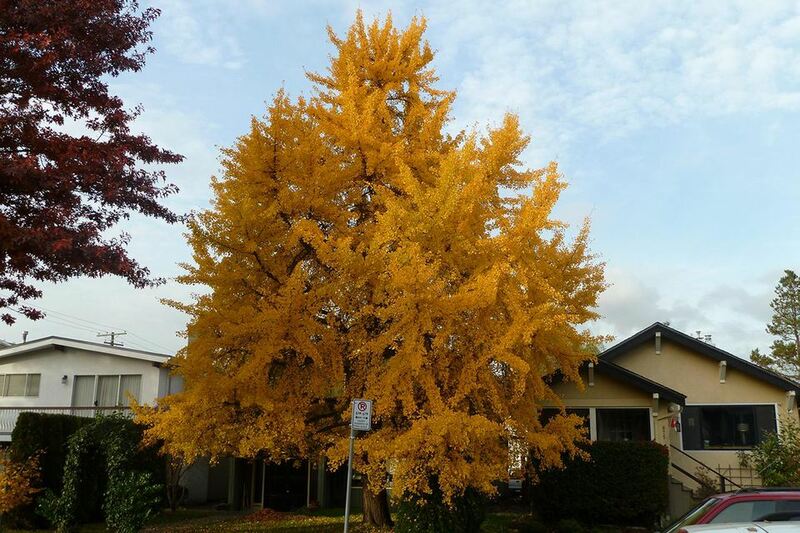 Ginkgo biloba grows to a size of 50-75'+ high and 50-60' wide. It usually forms a pyramidal to irregular shape. The leaves are 3" and fan-shaped. They turn yellow in the fall before dropping off. Ginkgo biloba is dioecious, meaning that male and female parts are contained in separate flowers that grow on separate trees. The male trees have drooping catkins, while the females have drooping flowers. Both appear in March and April. The female trees produce very smelly 1-3" fruit that appears in autumn. Male trees should be planted to avoid the smelly fruit. However, trees from seed may take more than 20 years to flower and reveal their gender. This can be remedied by buying cultivars as these have been grafted from male trees. If you have a tree of unknown gender, plant it by itself with no other ginkgoes around to avoid possible fruit production. Ginkgo biloba is a good substitute for quaking aspen. Both flutter beautifully in the wind, but quaking aspen is very good at sending up suckers all over the yard. If you like variegated leaves, some cultivars include 'Summer Rainbow', 'Variegata', 'Majestic Butterfly', 'Sunstream' and 'California Sunset'. Ginkgo biloba can be used as a shade or specimen tree. It is too large for street use. Ginkgo biloba will grow best in part to full sun and is a splendid tree for the urban landscape. It is highly tolerant of many soils, pH, salt, and pollution. However, do make sure it is well drained. It also does not tolerate over-watering well. When it is young, Ginkgo biloba should be pruned to form a central leader. Fortunately, Ginkgo biloba is not usually affected by any pests or diseases. The most commonly known medicinal use for Ginkgo biloba is to improve memory. However, as our Alternative Medicine expert Cathy Wong notes in her ​Ginkgo health article, it can also be used for tinnitus, glaucoma, Alzheimer's disease, sexual dysfunctions, peripheral arterial disease, enhancing blood circulation and macular degeneration. Note: The preceding section is for educational purposes only and is not meant to be medical advice. Check with your preferred health professional before taking Ginkgo biloba for medicinal reasons.